The official teaser for the new HateSphere album, The Great Bludgeoning, is now online. Can be viewed below. Check it out and share with your friends. Thanks for the support. The Swedish technical death force DIABOLICAL will celebrate 15 years of existence by doing some selected European dates in September. Each date will see different local support bands and special guests. Considering the nature of the tour, the band will do more old material than usual, covering all five official records released until now. “We see this partly as a celebration of the 15 years that was, but mainly as an introduction of the 15 years that are to come. It is a great opportunity to pick up older material, and revisit some good and bad moments from the past. Looking back is only enjoyable to some…” says founding member Sverker Widgren. DIABOLICAL have during the last 1.5 decade constantly been progressing, refusing to do the expected. Following the success of the second full-length album “A Thousand Deaths” (2002) the band toured Europe several times in 2002-03 with AMON AMARTH, VOMITORY and DEFLESHED among others, co-headlined Open Hell festival (2002) and Kaltenbach Open Air (2003) and played several other festivals as well. The albums were later re-released in South America, and both albums were released in the USA as well. In 2008 DIABOLICAL returned with full force and delivered a milestone in their discography; taking their innovative death metal a huge step further with “The Gallery of Bleeding Art”. The album received brilliant reviews and was followed by a two small but very successful headline tours though Europe. In November 2010 DIABOLICAL released the single “Eye”, and January 2011 their latest CD entitled “Ars Vitae”, containing 17 tracks from different parts of the band’s career. The newest material was recorded at Necromorbus Studio in 2010, and was again produced by founding band-member Sverker Widgren. Also, the CD contain a full live concert that has never been released before, and a remastered version of the “Deserts of Desolation” MCD, sold out since many years. Having been a part of the death metal scene for 15 years, and releasing albums for over a decade, DIABOLICAL still manages to put out some of their best material up to date on “Ars Vitae”, proving that the band still progresses and has a great future ahead of them. 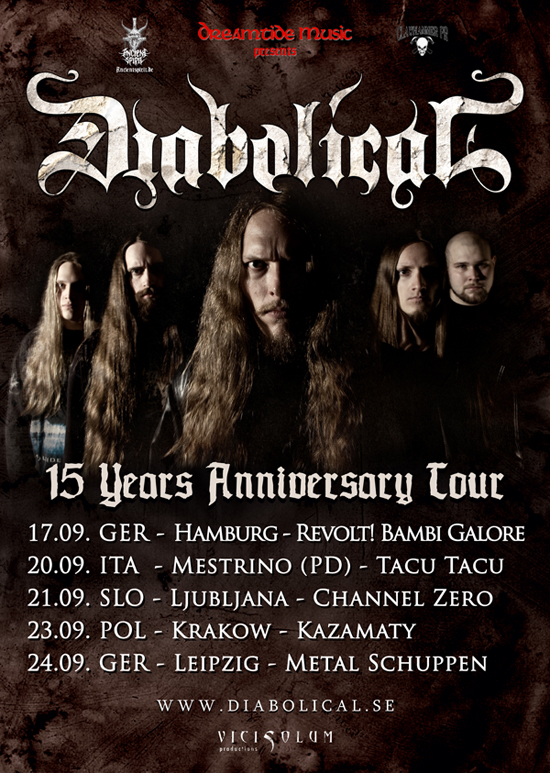 In November 2010 DIABOLICAL toured Europe with URN and INTERMENT, and followed it up with 11 concerts in Russia in March 2011 and various other shows during the spring. In September 2011 it is time to travel through Europe once again to celebrate 15 years of existance, doing some selected show during their 15 YEARS ANNIVERSARY TOUR. Swedish Metal legend ARCH ENEMY will soon be touring through Europe to present their new album “Khaos Legions” live on stage! Main support is coming from label mates Warbringer, Chthonic and Engel (Swedish dates only). And they would like to have YOU as a local support to bring the Khaos to the European clubs! Please note that this contest only applies for the tour dates in Germany, Switzerland & Sweden! Head over to http://www.khaoslegions.com/bandcontest to submit your band. You can only apply for one city only. For each tour date we will select 4 local support bands, which will get the chance to open for ARCH ENEMY if they win the public voting. The winning bands will be announced on September 26th and will receive detailed info from Century Media and the band’s crew about the exact procedures on the show date. In case the winning band can’t play the show (for whatever reason) the second winning band will be chosen. Thanks to our dear partners in crime, Dean Guitars & Rotosound Strings, we will give away a Michael Amott signature Dean Guitar plus a set of guitar strings to the band, which has gotten the most votes in the public voting. The critically acclaimed album “Demonoir” by Norwegian black metallers 1349 will be reissued as a limited box set as part of the Indie Recordings Norwegian Collector’s Edition Series. It contains seven bonus tracks, including an unreleased track that did not appear on the expanded edition or the limited edition, 12-page booklet, poster, guitar pick, a patch and autographed photo card. The box is handnumbered and limited to 1000 copies worldwide. “Demonoir”, the fifth full-length album from 1349, was recorded at Studio Nyhagen, deep in the woods in Norway with Tom G. Warrior (HELLHAMMER, CELTIC FROST), who showed the greatest respect for the task and played a key role as motivator and catalyst. His technical role of the recording was that of a co-producer, but far more important was his presence and understanding of what a challenging project “Demonoir” was. Onslaught Radio and CraveMetal.tv conducted separate interviews with vocalist WINTERSUN/ex-ENSIFERUM singer Jari Mäenpää at this year’s edition of the Bloodstock Open Air festival, which was held August 12-14, 2011 at Catton Hall in Derbyshire, United Kingdom, can be viewed below. You can now watch the interview footage below. 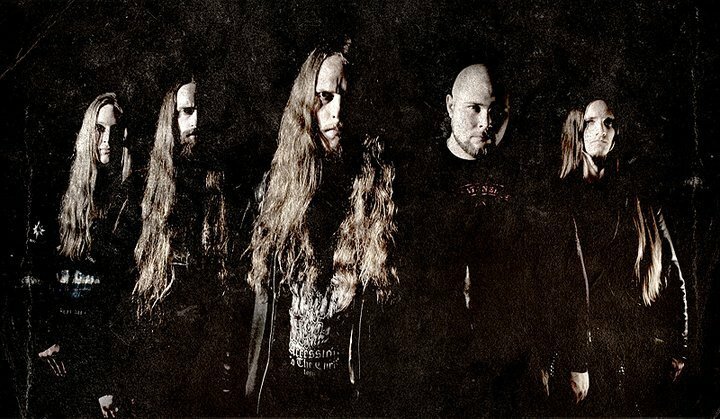 WINTERSUN is continuing work on its long-awaited second album, tentatively titled “Time”. Songtitles set to appear on the CD include “Sons Of Winter And Stars”, “Land Of Snow And Sorrow”, “Time”, “The Way Of The Fire”, “One With The Shadows”, “Storm” and “Silver Leaves”.